Cocoa and semi-sweet chocolate chunks combine to make these moist brownie-like cookies. 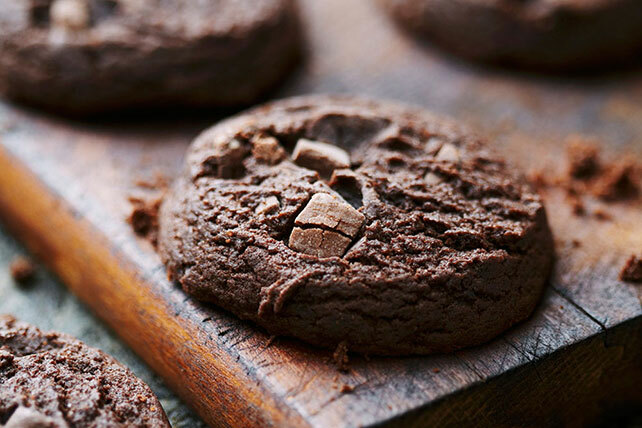 Try this Double Chocolate Chunk Cookies recipe at your next get together. Combine flour, cocoa, baking soda, and salt in medium bowl. Beat butter, granulated sugar, brown sugar and vanilla in large bowl with mixer until blended. Add eggs, one at a time, beating well after each addition. Gradually beat in flour mixture. Stir in chopped chocolate. Drop tablespoonfuls of dough, 2 inches apart, onto ungreased baking sheets. Bake 9 to 11 min. or until cookies are soft to the touch but tops are still slightly shiny. Cool on baking sheets 1 min. ; remove to wire racks. Cool completely. Replace the Baker’s Semi-Sweet Chocolate with 1 pkg. (170 g) Baker’s White Chocolate for a two-toned chocolate cookie.